In the Fire world, seventeen-year-old Leah is the illegitimate daughter of one of the realm’s most powerful lords. She’s hot-blooded – able to communicate with the tempestuous volcano gods that either bless a civilization or destroy it. But then Leah discovers she’s a Caller, gifted with the unique – and dangerous – ability to “call” her Otherselves in mirror worlds. And her father will do anything to use her powers for his own purposes. In the Water world, Holly nearly drowns when she sees – and interacts with – Leah, a mirror image of herself. She’s rescued by Ryan, a boy from school with a secret he’d die to protect. Little do they know, his Otherself is the son of a powerful volcano god at war in the Fire world…and he’s about to fall. Thank you to Entangled teen and Netgalley for this review copy. This book took me a little while to get my head around, but once sorted it made plenty sense. Leah lives in the Fire World and has always wanted her dad, a Duke to acknowledge her as his daughter. Holly is from the water world and has always resented her father and where he gives his attention. What they don’t know is that they have copies of themselves over five different realms. Holly and Leah are written to be two very different characters although they are “the same” people throughout the realms and this makes for interesting perspectives between the two. Leah looking into Holly’s world and life is unaware just how much they differ and how to act. It is her naivety that helps garner just how similar both girls are. They are both strong independent girls with a weakness and resistance to orders. As they explore the idea of romance, albeit in different ways they know that not all is what it seems in their worlds and that there is someone out there who is willing to break their worlds futures. The world setting is very well scaped and the water world being our earth is an interesting twist as the reader would have expected to true world to be the world we know today. The description of the fire world relays to the reader just how dependant they are on the volcanoes and how desolate their lives can be. The water world is what we come to expect on earth, cars, parties and movies. Overall I really did enjoy this book once it got into the nitty gritty scenes, there was a lot of story to build for what I’m sure will be a popular series with many fantasy elements inter spaced. 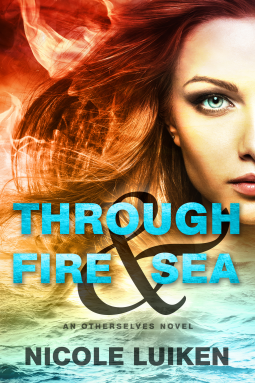 Whether you like dragons, mermaids, alternate worlds or a plain old romance this book is for you.